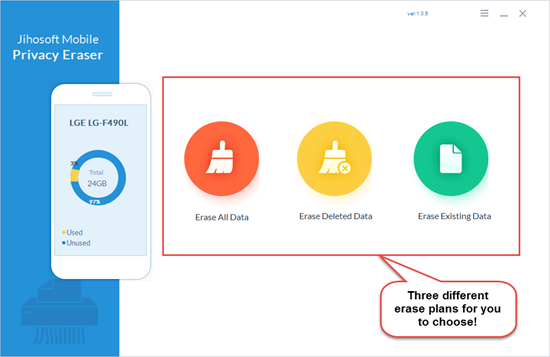 Jihosoft Mobile Privacy Eraser uses powerful data erasing algorithms to erase data permanently, all erased files from your mobile devices other people can\'t find them back. And it can not only just erase data in your mobile devices, but also can wipe the data which is deleted before. You can use this function to wipe deleted data and make them unrecoverable. Software provides data classify function, so you don\'t have to waste your time in selecting data like photos one by one. It will show you the data in types, select all data in same type and erase them easily. 1. Provide 3 different erase plans: \'Erase All Data\', \'Erase Deleted Data\', \'Erase Existing Data\' for users to choose, in case of different requirements. 2. 5 powerful erasing algorithms are available. Highly keep your private data from leaking. 3. Preview function allows users who using \'Erase Existing Data\' plan, to browse and select data before the erase. 4.Mobile Privacy Eraser works well with smart phones like: Samsung Galaxy S8/S7/S6 and other popular Android devices such as, Huawei Mate 9, P10, P9, HTC One A9, M9, M8, M7, Google Nexus 6P, 5X, 6, 5, LG, Sony Xperia, Motorola Droid Turbo, Moto X, G, E and many more Android devices.